Empty case features zippered compartments. This item has been discontinued by the manufacturer. Please use item 168-0064-001 if you have a Powerheart G3, or use XBPAED001A if you have a Powerheart G5. EMPTY Total Response Rescue Backpack by Cardiac Science. 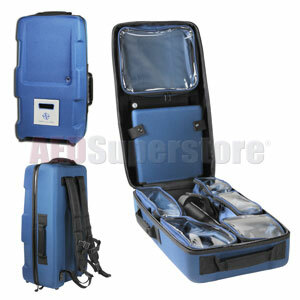 Holds the Cardiac Science AED and size D or C oxygen cylinders. Fill with your own supplies you would like to have available in case of an emergency. When fully equipped, the Cardiac Science's new Total Response Rescue Kit can help your team respond to over 95% of the most common workplace medical emergencies. Along with your Cardiac Science AED, this exclusive Rescue Kit will contain everything you need in emergency situations to make your workplace safer and more secure. The Total Response Rescue Kit is specifically designed to hold your Cardiac Science AED, an emergency oxygen cylinder, oxygen tubing, oxygen regulator, personal mask with oxygen inlet, blood borne pathogens responder kit, blood borne pathogens clean-up kit, first aid kit, and an absorbent towel. Together with the Total Response Rescue Kit and Cardiac Science AEDs, they provide a complete Cardiac and First Aid solution. This exclusive bag includes four separate compartments for storing accessories and Ready Kit supplies. Having the AED, the Rescue Kit, and extra accessories readily available is critical. Supplies in backpack are shown for demonstration purposes only and are not included.